Annual vegetables, fruit and nut trees, small flock chickens, aquaponics, perennial herbs, and more. One of the most critical aspects of the modern homestead is backyard farming. The current food system is both unhealthy and unsustainable. Modern agriculture is leveraged to the hilt, relying heavily on chemicals, enormous government subsidies, soil depleting techniques, and TONS of cheap oil. Our goal is to escape that ugly part of the modern American life, as much as we possibly can. Having your own backyard farm significantly reduces dependence on grocery stores and a delicate transportation system. What is A Backyard Farm? A backyard farm is the entirety of your food production efforts–plant, animal, and otherwise. Whereas traditional commercial farming grows 1 crop in straight rows over thousands of acres, backyard farming is infinitely smarter. By mixing and matching the foods that you grow in “guilds”, you can grow more types of food, and more of each type! Put simply, the backyard farm is a resource-efficient combination of guerilla food production zones, that are each optimized for their highest and best uses. Have a piece of property that is naturally more shady and has acidic soil? Put blueberries there. Have a south-facing wall that gets full sun and is tough to irrigate? Plant sunflowers up against it. Live in a climate that gets late season freezes? Save your fruit by planting trees that bloom late. Have a pest problem? Get a few chickens to devour em. These and a million other simple solutions provide extremely practical ways to maximize your backyard farming. This approach isn’t anything terribly new or cutting edge. These are things that our ancestors knew and practiced as a matter of survival. Your food production plan is really just a component of your bigger, more holistic homestead plan. It begins with an assessment of your situation and food goals. Specifically, when we’re talking about our “situation”, perhaps the biggest thing to think about is climate. What is the biggest limiting factor of your climate? Is it generally more hot and dry, or cold and wet? Or you may wind up in a place like the American south that’s hot and wet. No matter what your climate, what are the all-star, well-adapted plant varieties in your area? Get a hold of your local state extension office, and jump on local Facebook groups. When you’re driving around town, pay attention to the “weeds” that are growing by the side of the road. Remember, these are plants that aren’t getting any special fertilizing, watering, or anything else. Chances are, there are probably a few of these “weeds” that are edible, medicinal, or otherwise useful in your food forest. Being the guerrilla farmer that you are, you need to make use of any and all resources you have at your disposal. Do you have access to manure that can be used for fertilizer? 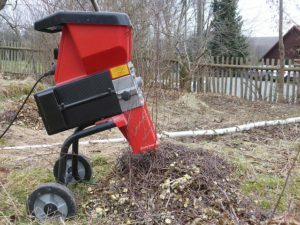 Any mulching materials? What about discounted trees or shrubs? In many areas, nurseries will significantly discount trees and shrubs towards the end of the season. I have also found that several municipalities will offer discounted wood chips, soil, and mulch to residents. Stretch your dollars by taking advantage of these kinds of things! By checking with neighbors or in your local classifieds, you may find free trees, mulch, compost, animals, tools, and much more! Another thing to take stock of are any food producers that are already on your property. You may already have some great trees or animals on your property that can contribute significantly to your homestead. If so, count this as a blessing, and don’t take it for granted. Even if it might not be the exact choice you would’ve made (in species, location, etc), don’t thumb your nose at anything that’s already in place–especially if it’s currently producing. After your homestead has been established for a few years and you’re producing other food, you can always get rid of or move something to a new location, but until then, we always advise people to keep the producers, even if they’re ugly or in a less-than-ideal location. Think about your ancestors–would they have ripped out a productive fruit tree, just because the fruit was smaller or on the wrong side of the house? Additionally, remember your neighbors. It may be that they grow some food that you don’t. If you are on good terms, they will likely trade with you (or more likely, they’ll just tell you to help yourself!). Where are the best spots to grow things on your site? Where are the best spots for your critters? What about your fish pond? Bees? Remember the traditional commercial farms? They usually grow one crop in straight lines, as far as the eye can see. But your food production is different. Because you aren’t limited by the constraints of large machinery, you can produce food anywhere you want. Don’t pigeon hole yourself by thinking that you have to have 1 “garden”, in a 16′ x 20′ plot somewhere. Your food production can take place in 15 different areas on your property, and you can grow 10 different things in each of them. 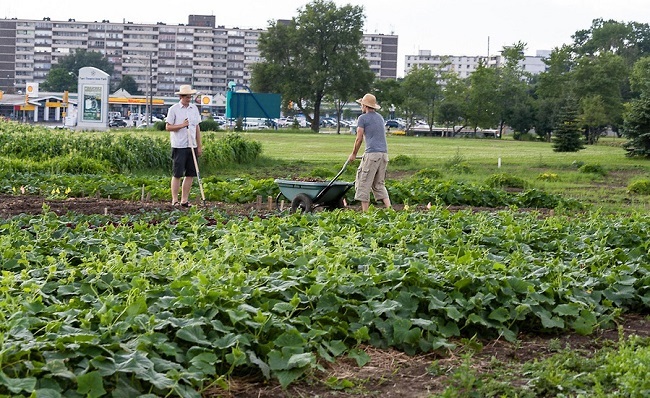 This urban farm in Toronto makes use of under-utilized space by growing food there. If you live on a smaller “microstead”, the goal should really be to blanket your entire property with food production (maybe some of it is more aesthetic and goes in the front yard, but nonetheless, food production). If you live on a larger, more broadacre homestead, then you will probably not spread your efforts out over your entire property, but more for convenience than anything else. This is where the scale of permanence comes into play. Food production is extremely important, but can likely be fit around the less flexible pieces of your homestead. In general, I would site roads and other access, ponds, water supply, swales, earthworks, and structures all before food production. Trees and other perennials. These are the most permanent, so you need to make sure you get their placement right. They also take the longest to get producing, so from a practical standpoint, it also makes sense to get them in the ground the soonest. Animals. Animals are not as permanent as trees, but more permanent than annuals, and can have complex requirements (shelter, water, wind protection, sun, shade, etc). They also provide valuable macronutrients that will be a backbone in your food security plan. Annuals. By definition, annuals only last one season anyway, so their placement is not as critical . It’s important to remember the goal of food production on a true self sufficient homestead. It isn’t to commercially produce enough food for you to make your living off of. On the other hand, it also isn’t about just growing a few exotic “hobby” plants. The goal is to produce as much of your family’s food as possible. This is the context that’s important to keep in mind. 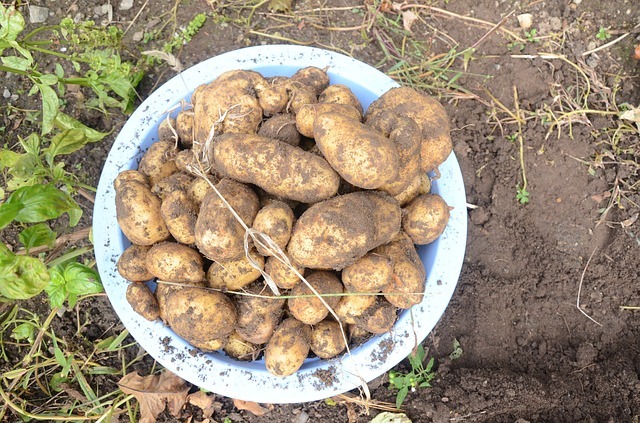 Potatoes have been known as a “staple” crop for years, and are an easy to grow source of macronutrients. On smaller properties, they can be grown in trashcans or other vertical containers. As was mentioned above, it’s important to be really sensitive to your climate, and which plants and animals are “native” to it, or at least well-adapted to it. Apart from that however, the backyard farm of a true self sufficient homestead should be focused first on keeping you alive. Macronutrients. Proteins, fats, and carbohydrates. Yields with calories. If you think about it, a small flock of regular-producing chickens, can basically feed a family 1 meal a day with their eggs. If you figure 3 meals a day (which I understand isn’t necessarily gospel), this means that in rough numbers, those chickens have made you 33% self sufficient. I understand, there are plenty of conditions and disclaimers that could be stated here, but this is essentially how you need to be thinking about it. Nut trees are another excellent and long-lasting source of fats and proteins. They are often overlooked, because they aren’t the easiest things in the world to harvest, shell, and eat, but they have been a mainstay of many civilizations and really shouldn’t be overlooked on your homestead either. Potatoes are another great source of macronutrients. They can be grown in lots of climates, and if harvested properly, store extremely well (up to a year!). For all the flack they catch for being white carbs, the simple truth is that they can keep you alive. Squash, beans, sweet potatoes, fruit, corn and other grains, all provide a great source of macronutrients, that can keep you alive. Cattle and other large animals are obviously great sources of macronutrients as well. Remember, just because something is a macronutrient, doesn’t mean you have to grow it if you absolutely hate it. Find a few of these that you can learn to grow, preserve, and store, and you’re on your way towards food security. The next type of food that you should think about in your backyard farming is food that is expensive to buy at the stores. Producing these foods will save you money, and they could also be good items to trade with your neighbors for things you don’t have. 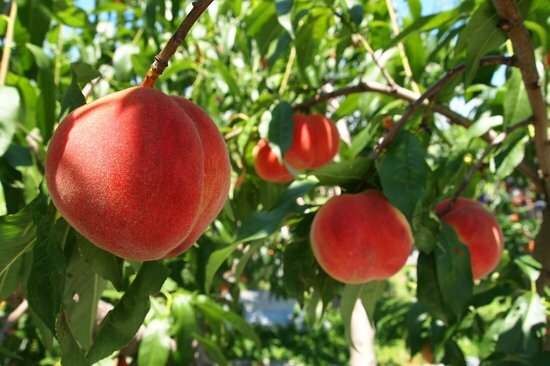 Incorporating a small fruit or nut orchard gives you the ability to plant one time, and then grow high-value foods year after year. Fruits are a really good example of this. Watermelon, cantaloupe, honey dews, crenshaws, and other melons are great. Peaches, apricots, plums and other stone fruit. Berries, apples, pears, and anything else that’s sweet and juicy could be a great candidate here. Valuables could also include things like microgreens, or even duck eggs. Anything that your family likes to eat, that is a little bit expensive. Remember, the goal or homestead production isn’t to get rich by selling a giant crop of something, but to help you be self-sufficient. There’s nothing wrong with growing and selling food for a living, but that’s “market farming”, we’re talking about backyard farming. Finally, think about your micronutrients. These are foods that are higher in vitamins, but not a particularly high source of calories. Think salad vegetables. Lettuces, tomatoes, spinach, kale, onions, water chestnuts, peppers, etc. Edible herbs and mushrooms also fall into this category. They’re loaded with nutrients, but not calories. Micronutrients have an enormous amount to do with your overall health and well being. They are beneficial for the immune system, and digestion. They keep your body well-oiled and your organs functioning properly. They fall lower than macronutrients on the prioritized list of a homestead farm, but they are still critical. Keeping all this in mind, how do you actually do it? In phases. We recommend that you look at establishing your homestead food production as a 3-5 year process (although in truth, it could take longer). The first year is when you should think perennials. As a food producer, in order to be able to come close to sustaining yourself, you need to slant your efforts towards incorporating trees and other permanent systems whenever possible. Perennial shrubs, vines, fruit and nut orchards, and other permanent elements increase in value and yield every season. With these systems, time is the biggest determining factor. The sooner you get them in place, the quicker you get bigger yields. Think carefully and site your fruit and nut trees, berries, vines, and other shrubs. This gives them time to get their roots established and starts the clock on their time to bearing fruit (which will usually be 3-5 years, and 10 years before max production). The first year is also a good time to get compost, mulch, and other raw materials on site. Lest anybody get the wrong idea, it’s still a good idea to grow vegetables and other more traditional “annuals”, but they will never come close to having near the ROI that permanent elements have, because by very definition, you have to re-establish them every year. Permanent elements are the “set it and forget it” of food production. The second year is a good time to begin layering in other shrubs, herbs, and annuals that make sense around your trees. If you are going to have smaller critters like chickens, ducks, meat rabbits, or aquaponic fish, this is a good year to think about getting them started as well. 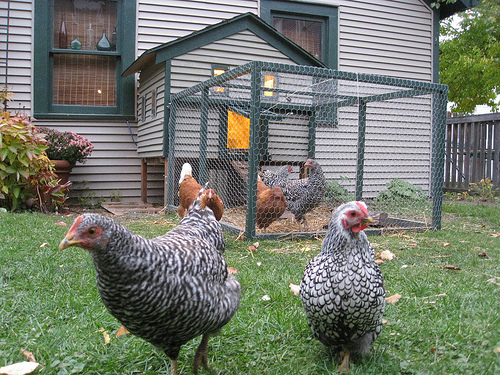 Backyard chickens are the ultimate “one size fits 95%” solution. Having a pair of good laying hens is an AWESOME way to ramp up your self-sufficiency. Chickens vary by the breed, but on the whole, they are low maintenance, and offer a long-lasting source of protein. Chickens give you multiple outputs–eggs, meat, and fertilizer. They’re also good for pest control, and working your land. In short, chickens are the “one size fits 95%” solution. By the third year, you will be well on your way to some decent food production. You have seen your property function in all 4 seasons a couple times now, and you have a good idea of the time constraints and work involved. This is a good year to introduce larger grazing animals (if this is part of your food production plan). Remember to still protect any trees that are young enough to be damaged or destroyed by a wanton grazer. Each has an accompanying cost/benefit analysis, and a space requirement. Rabbits or aquaponically-grown fish can be done in just a few square feet, whereas something like a goat would require greater area, ducks require pond(s), and cattle require even more space still. Goats are handy for their edible outputs, and for their ability to accelerate land transformation. One animal that isn’t usually considered livestock in the traditional sense, but is nevertheless still really important to incorporate on your property is the honeybee. Bees are tremendous pollinators, and will do a lot to help you get earlier production, more production, and just overall better plant health. In addition to the pollination benefits, you get the added benefit of having their honey and wax that you can use for a variety of products. This is obviously a little bit of a simplistic overview, but in general, phases are how you need to do it. For the work involved, it’s simply not realistic to think about trying to get everything started at once. Remember, this is your homestead. Hopefully, you aren’t going anywhere for a while. 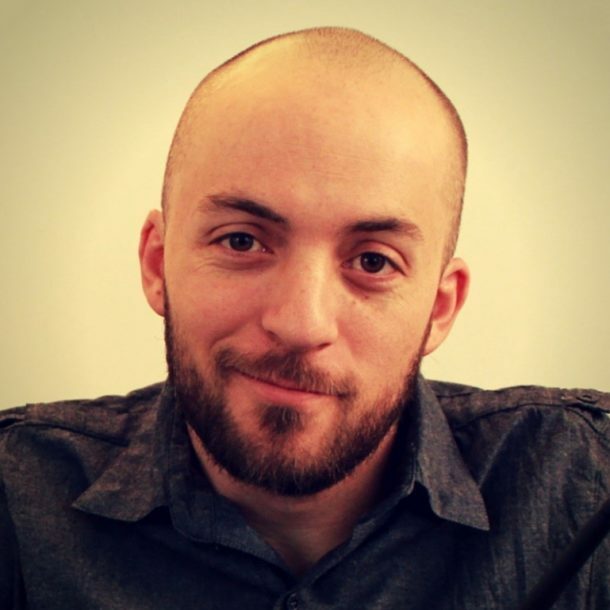 It’s better to take your time being thoughtful and observing, than rushing into more than you can handle, getting burned out, and having a bunch of stuff fail. Many of you may be familiar with the phrase “food, not lawns.” This is an initiative that started several years ago, and has spread through social media (with several similar groups springing up all over the world). The main idea of “Food, Not Lawns”, is that it’s ok to challenge traditional norms, when there’s a better alternative. Specifically, lawns require a lot of time and money to keep up, and for the average homeowner, don’t yield anything except aesthetics. On the other hand, growing food has an enormous, live-giving benefit. And it can actually be very aesthetic as well. We support this initiative wholeheartedly, and thought we would just leave this with you as a final parting thought. We want to remind everyone that your backyard farm is one area where form should follow function. Grow things that will help you to be truly self sufficient. Over the last several years, the term “food forest” has become popular, particularly among people who design and implement permaculture styled farms. While the term may be relatively new, the idea is ancient. Essentially, a “food forest” mimics a natural forest system, by vertically layering levels of production to get more out of the same surface area. A canopy layer – these might be full grown trees, 25 feet or taller. Ground cover – grasses, clovers, etc. Although you really don’t need to have a “food forest” that is layered exactly like that (or even have a food forest at all), you should be thoughtful about how you can clump plantings together, to minimize space requirements, and maximize yields. It’s also not necessary to have every single thing you plant be a food-producing tree or shrub either. There can be a lot of upside to having solid “support species” scattered throughout your backyard farm that provide shade or soil benefits. While the real goal of food self-sufficiency is to be able to produce a majority of your calorie consumption, it’s a difficult thing to put into practice, simply because we like to eat! By the time we’re old enough to tie our shoes, we have developed palettes that are acutely aware of all kinds of wonderful and far off foods, with special ingredients, processing (a whole separate topic), and high dependence on monoculture farming. Preservation is a critical part of your overall food security plan. Learning dehydrating and canning are 2 easy ways to get started. Food independence is an exercise in both learning to produce more varieties of food, and eat fewer. It also takes time to get food yields that will sustain you. 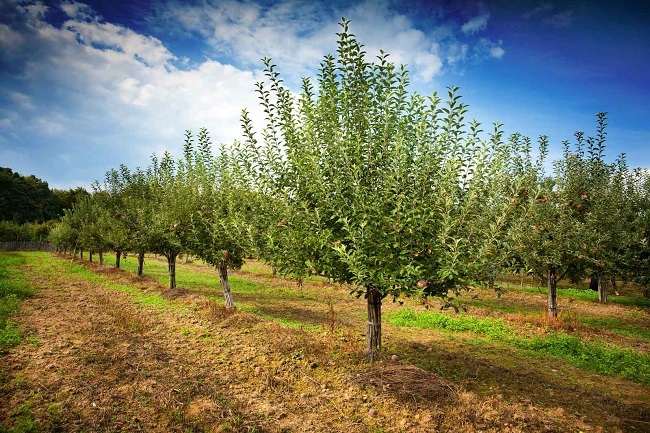 A fruit and nut orchard isn’t exactly something that you can flip the switch on. But by combining area-intensive permaculture practices with intelligent site design, you really can get close. 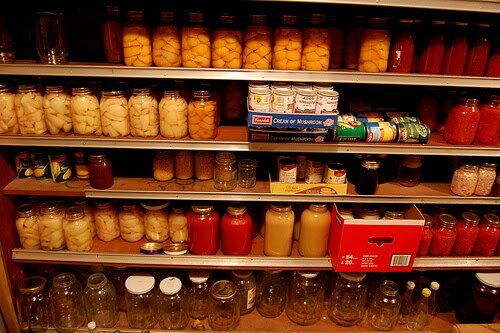 One thing that you can do to close the loop between your food storage and the food you are producing on your property, is to learn some food production methods. While there are a variety of ways to do this, canning and dehydrating are 2 of the more easy and low tech ways to do this. Learning to do these will allow you to preserve some of your own harvest till later in the year, when food wouldn’t otherwise have been able to be grown. Hot water bath canning will allow you to bottle up and preserve things with a high acid content, such as tomatoes, apricots, salsa, and many other fruits. Pressure canning allows you to store meats, vegetables, and pretty much everything else (contingent upon how long the food itself will stay good for). Dehydration of certain foods can be super low tech—like putting fruit on screens in the sun to naturally dry. You can also find a bunch of commercially available food dehydrators, which will give you greater control over the process and shorter dry times.